Hey all, how goes it? I think its time I start to document my project because sometimes its just easier to be able to look at everything thats been done and everything that needs to be done. 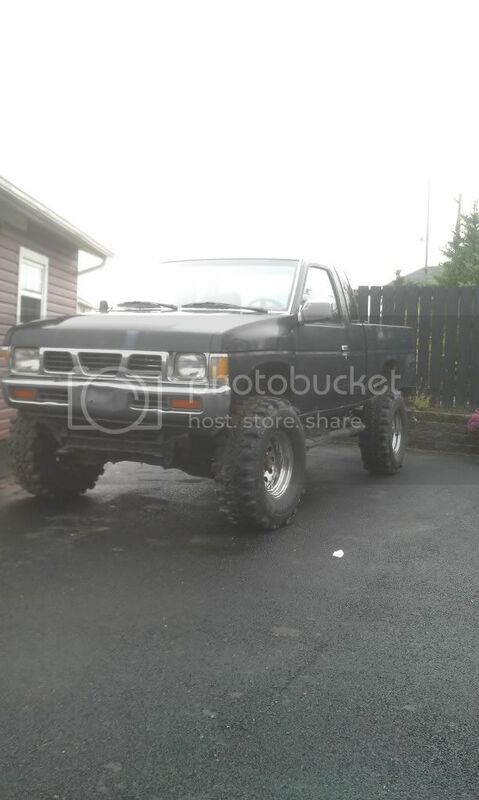 So let me first off intoduce my girl, shes a 1993 nissan d21, v6 5speed 4x4, base model extended cab. I bought her in november of 2013 not running, for 850$. 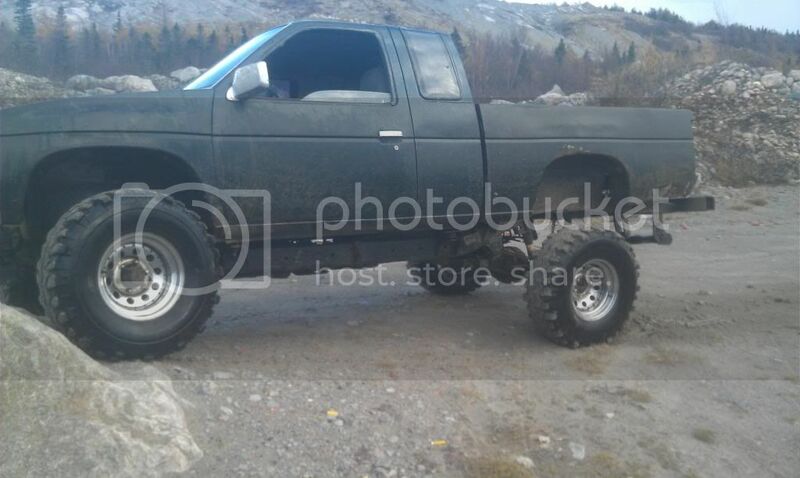 It has a 3 inch calmini body lift, and a 3 inch calmini suspension lift, 33 inch super swampers, new clutch, new starter motor and a whole pile of problems. A new fuel pump and set of spark plugs had it running. Since then I have changed the oil, cap and rotor, new bulbs in the taillights, seafoamed the engine, cleaned the air flow valve, egr valve, throttle body and intake manifold, and adjusted the idle screw. I have a new o2 sensor on the way, as well as warn mile marker locking hubs. Replacing the reverse light switch, bending the transfer case shifter so I can engage 4lo (the body lift makes the shifter hit the floor), and putting in a new o2 sensor because the engine is currently running too rich and causing plugs to go black. I dont know what my plans are for a new exhaust system but having a new exhaust built will cost me a fortune in labour. I would rather find a 2inch exhaust at the local scrapyard and retrofit it to my truck somehow. Rockauto has some fairly cheap exhaust parts and if needed I will possibly go that route. 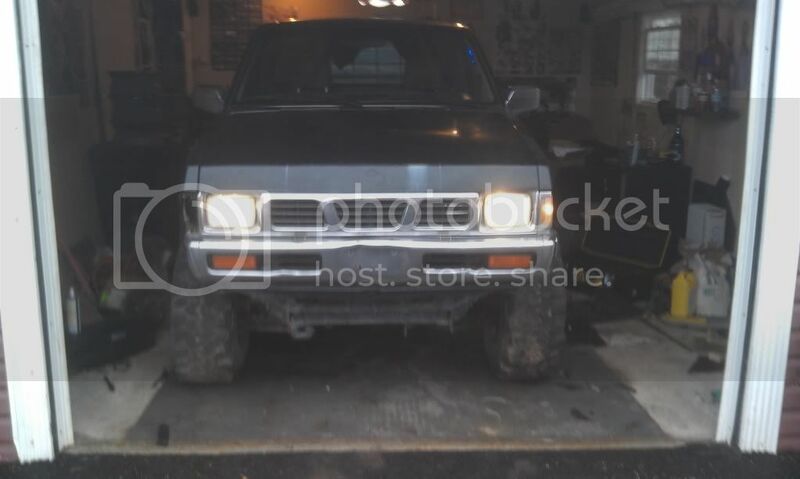 I would also like to do something either like a cheap locker for the front, or possibly a regear for my truck because I find it very low on power and the four wheel drive system to be very weak even in 4lo. I know these trucks are very low on power, but I don't have the budget or know-how to do an engine swap and I don't know of any power upgrades available for the VG30e for cheap so i'll have to work with what i've got. Unfortunately there aren't many 4x4 hardbodies around for inspiration so I'm not sure where i'm really taking this. I also have a 2004 Frontier 2wd 4cyl. This is my DD but i've worked on it a little too. little too much ground clearance for my tastes but i would drive the crap out of that HB - looks good keep us updated!! Nice another 4x4 look forward to seeing it develop. My plans are to fiddle with minor things until the spring when I can get to the scrap yard and scavenge some parts. I wish I could afford to replace the headers and do a dual exhaust setup but it's just not in the initial budget. 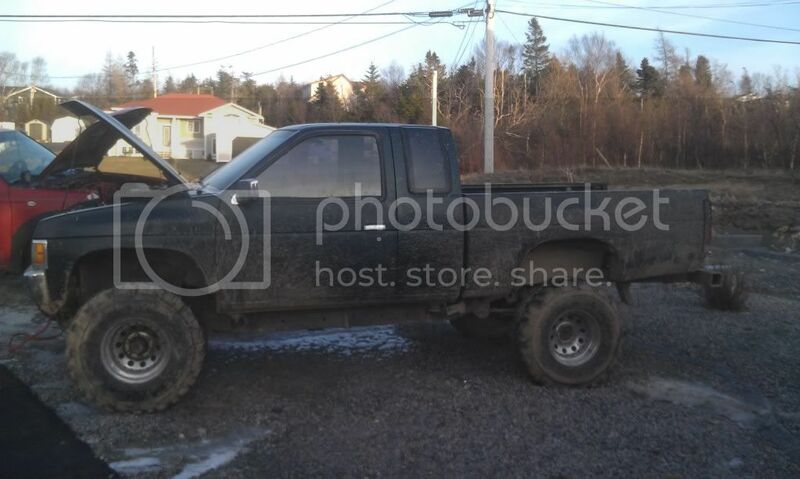 This truck will be my offroad truck but i'm working on making it road legal so I can avoid owning a trailer queen. The shackles installed are just 1" calmini lift shackles. I have the equipment to do a paint job on the truck but i'm undecided what color to go yet and that will also be in the spring. I'd like to swap out the 33's for some 35's eventually and then regear the diffs with lockers. I'm on a students budget so i'm just buying what I can when I get some spare cash. Hopefully by the end of this summer it will be road ready. I feel your power needs. I have a VG30i in my rig with 4.11 gears. Im still below 2500RPM at 65MPH and stock sized tires, passing is often a shift down thing. Cant imagine what it would be like with 33s. How does your intake look? Could you fab an cold air? Ive been playing with the idea with the "i" variant but lots of vacuum lines to deal with. This is what Im thinking for an exhaust when I feel like spending the cash, as I am also a student. Maybe itll give you some ideas. I want to do thorleys and a cat delete. Stuff the muffler way back where the cat sat. I might do some CFD or experiments to see how the note will change. Im looking for a low note. Then put a 3-4" tip that will be mostly hidden to get that rolling thunder somewhat like what you hear from a diesel but not as crazy since its a 3.0 V6. Probably do a 2.25-2.5" exhaust from the headers out. Not sure on the muffler yet. I want it quiet but deep if possible. Looking for no drone when cruising but want to hear something if I put my foot in it. Currently, all I hear is T-belt whine and when steady near the top it sounds like a pissed and muffled chain saw. 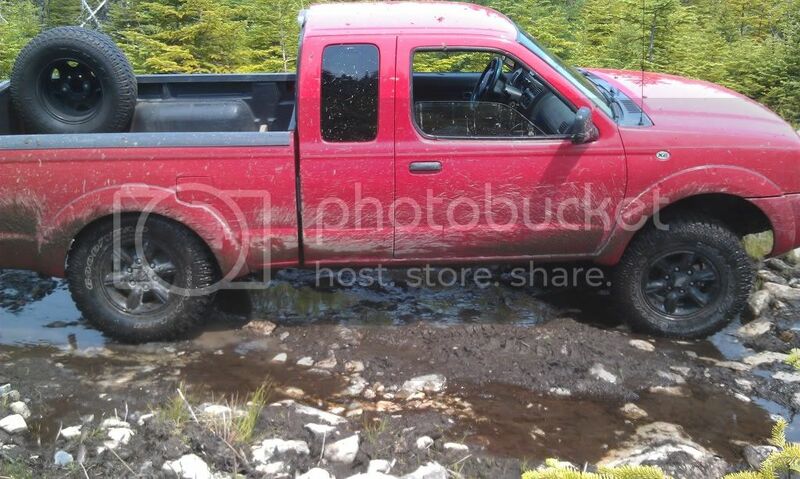 A buddy of mine had a similar setup with a ranger with a 3.0 V6 using a subaru muffler and a 4" tip dumping out the side. His was deep but a little ricy due to the scubie muffler. He had stock headers. As for a front locker, the C200 rear axle out of a 4cyl has a limited slip that will fit in your R200a front will minor work. I would love to do this mod but havnt looked into it far enough to say the exact costs. I believe Calmini and/or 4x4parts carry a locker or the LSD for the front. I would just rejuvenate the rear LSD if you have it. I have found it to be quite good though I am using alot less tire. nice looking rigs. hit up the j/ys for a pathy or HB with HG46 axles, that will help or find a later fronty or Xterra with HG49 axles. you will need to grab both axles for so the front matches yours and the others are R200 front axles but the HB and pathys have H233B with 31 splines (you can just drop the pumpkin in) and the fronty and Xs with HG49s have 33 splines so you just cant drop the pumpkin in. you may be lucky and find a rear LSD and as deerhurst said you can find a C200 rear LSD and fit it to the R200 front diff. LOL, nice truck, glad to see you got it running. Loving the feedback from you guys thanks. I actually have already done an axle swap in my frontier from a C200 rear to a H233b from a 2004 Xterra. Did it for the taller gearing to run 31's on that truck, but it's only a 2WD. The problem where I live is there are very few junkyards and even fewer with useable nissans in them. I would love to be able to find an X with the right gearing in it and in the spring I will have a look and hopefully come across something. I'm looking forward to getting to the junkyard and seeing what I can come across, is it spring yet? well, you could buy new gears but that would be pricey.